After the chilly temperature on Mt Ruapehu, we were ready for the warmth of the pools at the AC Baths. The water bombs, jumping from ropes and the water slides were enjoyed by all. It was warm down at that AC Baths and I loved going down the slides and I loved playing with my friends in the pools. This was a great opportunity to get warm after being in the snow. The water slide's were very fast. I really enjoyed spending time on the slides and diving off the bombing platform. I know we all enjoined the water slides at AC baths. The thing I enjoined the most at AC baths were properly the water slides because they were pitch black and because they were faster than any other slides. I really enjoyed being at the AC baths. It was a really good experience because we got to go with our friends, I really enjoyed going down the water slides because you could go fast or slow. The AC Baths were cool the most fun bit of all were going down the water slide and doing booms in the AC Baths. The funny bit was Mrs Hutchins going down the water slides. It was fun down at the AC Baths because there was two different slides and the was a bombing pool. My favourite part about the AC Baths was being able to spend time with everybody. I enjoyed not just the friends I play with everyday but with others that are and are not in my class. I would recommend if you were coming down that way to stop and have a bit of a swim. It was a good choice to go to the AC Baths after the snow to warm up. My favourite thing was going down the fast dark slides, and warming up in the hot pools with all my friends. On our fun day we went up to the snow, to have a play It . And it was my first time gong to the snow. I had loads of fun at the AC Baths with my friends. There was heaps to do. My favourite activity was the Tarzan swing. Being short finally paid off, because to go on the rope swing you had to be under 1.5 metres! Lucky for me. My favourite part at the AC Baths was the water slide because it was warm as we went through the darkness of the slide. It was such an awesome lot of out door pools, and a fun way to warm up. My favourite parts were doing bombs and dives off the bomb island, and swinging and jumping from the rope swing. But nothing could beat the mouth watering, truly appetising, awesome pepperoni pizza. 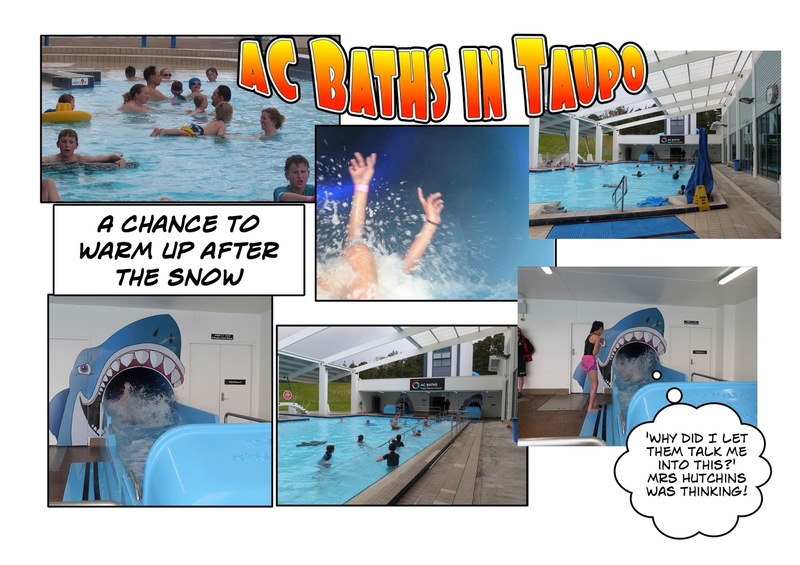 It was a good idea to go to the AC Baths in Taupo after the visiting the snow. It was nice to warm up in the heated pools! I really liked the bombing area where you could bomb freely without getting told off by the lifeguards! It was also nice to just float on a foam board in the middle of the heated pool and enjoy the warmth. Playing at the pool's and into the hot water. People booming every where in the water. People racing to use the flying fox. Diving into the water. Going into the tunnel and into the dark hole and down into the water. It was great to go to the AC Baths after going to the snow I really enjoyed the bombing pad because we could do bombs without getting told of by the lifeguards.